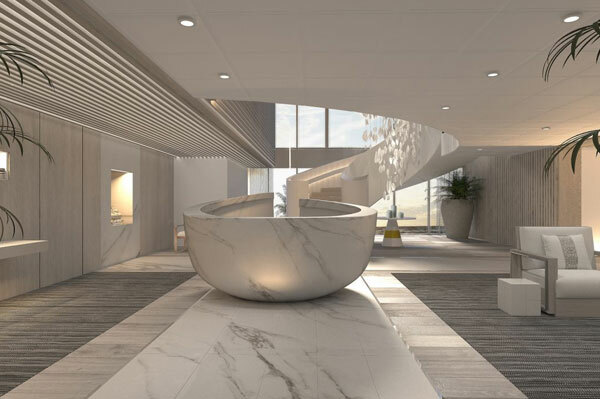 Celebrity Cruises has unveiled details about The Spa on Celebrity Edge, inspired by nature and featuring more than 22,000 sq. ft. of space for guests to renew, restore, and reinvigorate. Celebrity infused natural elements into every moment of the experience at The Spa through an original concept called SEA – inspired by the Sea, Earth, and the Air – which transcends the design of The Spa and treatments. SEA unites every experience throughout the wellness journey. Bespoke blended essences fill the air, kick-starting the path to total bliss. The Relaxation Lounge surrounds guests in a Zen-like ambience, clearing their mind before their treatments begin. And every treatment starts with a unique welcome ritual to prepare one’s mind, body, and spirit for the pure, unadulterated pampering to follow. The SEA Thermal Suite, the next evolution of the popular Persian Garden on the brand’s current fleet, with eight distinctive therapeutic experiences harnessing the benefits of natural elements: the Hammam, Salt Room, Steam Room, Rainfall Water Therapy Room, Float Room, heated tile loungers, Infrared Sauna, and Crystalarium. AquaClass guests receive complimentary access to the SEA Thermal Suite, among other complimentary amenities. The first line of ELEMIS BIOTEC facials ever offered on a Celebrity ship. A specialty treatment table collection that’s unrivaled at sea, including: Spa Wave MLW Amphibia Table: A first at sea, water filled cushions adapt to guests’ unique anatomy for the ultimate in comfort, as well as customizable colour therapy lighting; WellMassage4D Table: This award-winning treatment table, a Celebrity first, uses breakthrough technology to deliver a deeper and more relaxing massage; MLX Quartz Table: Another Celebrity first, warm crystals mold and shape around the body, releasing muscle tension and promoting a deeper state of relaxation. Ideal Image Ocean, The Advanced MedSpa, is another first at sea, offering esthetic services such as Dysport Wrinkle Treatments and Restylane Dermal Filler Treatments. Celebrity will partner with Kérastase, one of the world’s most advanced luxury haircare brands, to introduce the first ever Kérastase Institute at sea. The Barber offers traditional hot shaves and fresh cuts for the modern man. The Fitness Center will get those endorphins flowing with more Celebrity firsts, like hot yoga, Technogym Group Cycle, Fitness on Demand, cardio boxing, and the first Bungee Fit and Peloton bikes ever offered at sea. Celebrity Edge will spend its inaugural season sailing alternating seven-night eastern and western Caribbean cruise itineraries before transporting guests to the Mediterranean with a range of seven- to 11-night sailings from iconic cities like Barcelona and Rome in 2019.